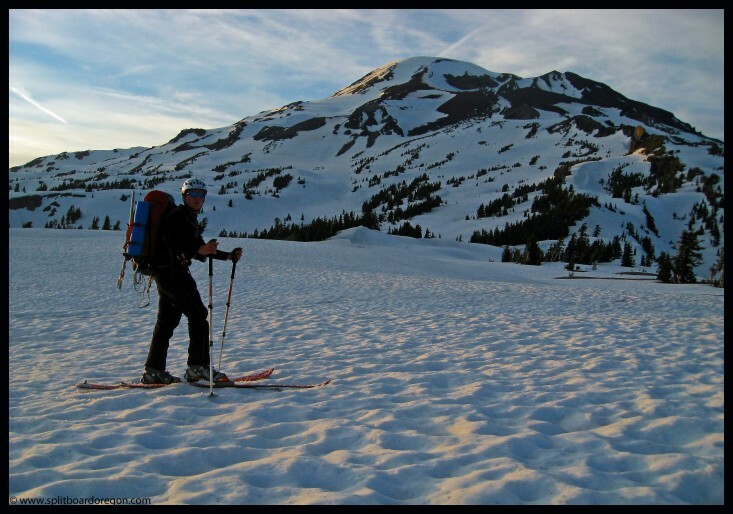 Sometimes things go exactly to plan on a ski tour, but often times, when looking to make turns in the Oregon cascades, having a backup plan in case things go awry is a good idea. 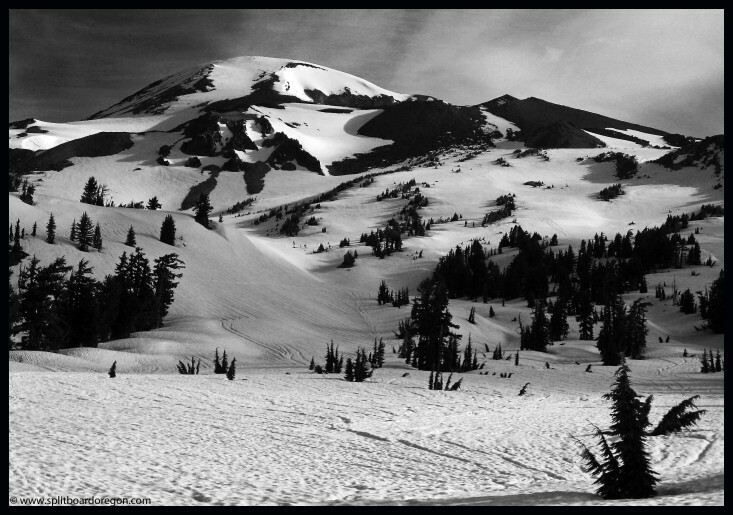 Such was the case for this trip to the South Sister. I left work around 3:00pm with the temperature near 90 degrees. The weather forecast called for continued sunny skies, with possible thunderstorms Saturday night. The drive over from the valley was pleasant, and I met Todd at the Devils Lake trailhead around 6:30pm. After quickly going through our packs, we were on the trail by 7:00pm. It was a bit humid for the skin up Hell Creek. We reached the big plateau shortly after 8:00, where the setting sun made for some nice pictures…. There were some sun cups on the long flat section, but the snow up higher looked prime. By 9:00pm, we had found a nice campsite about a quarter mile off of the main trail near 6700 feet. Camp consisted of an open patch of bare ground, where we pitched the bivies. 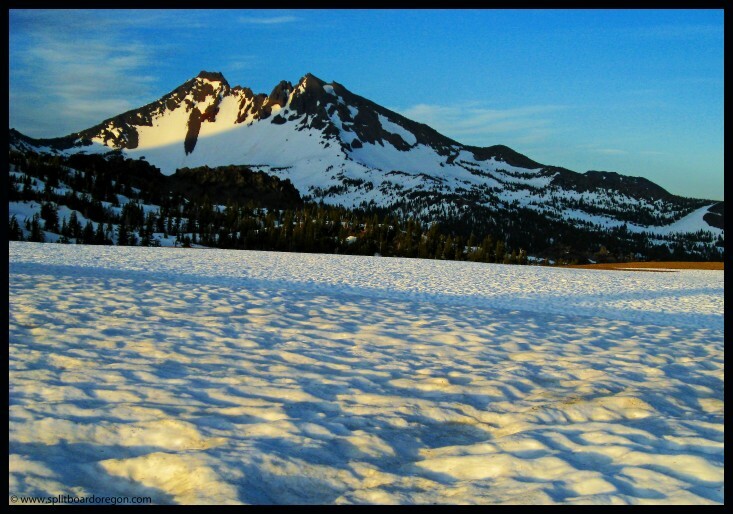 We were treated to great views to the south, as well as the South Sister itself right from our campsite. The next morning we awoke at 4:15am, melted water and had breakfast. The skies were partly cloudy but the summit looked nice. We were skinning by 5:10am and made good time up the hill. Off in the distance, thunder clouds had been building for some time and now looked menacing. 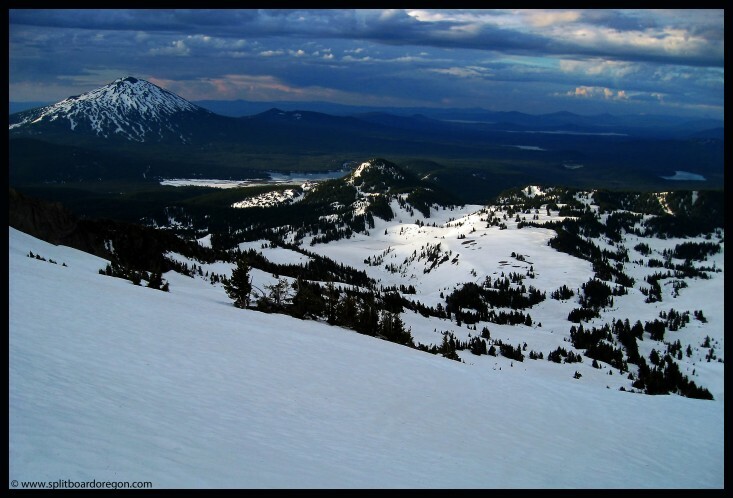 Here’s a shot looking to the south/southwest…..
Mt Bachelor to the southeast looked surprisingly calm however…. 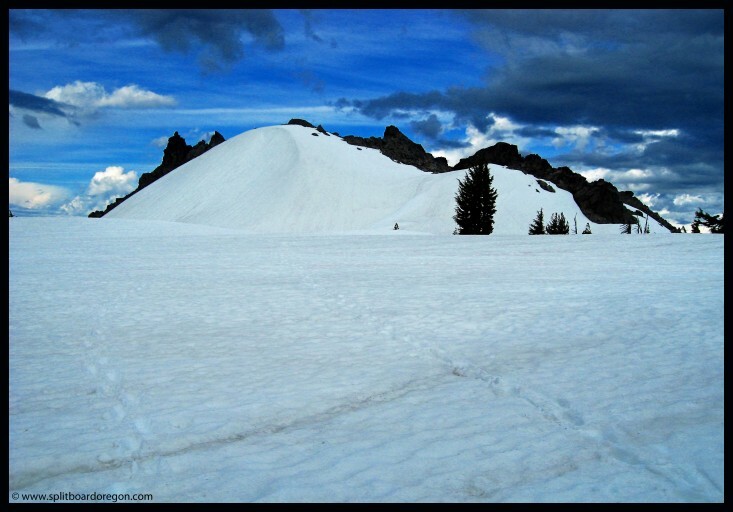 By 6:30 am, we had reached 8500 feet and were nearing the summit ridge and Lewis Glacier. Continuing up, a dark black cloud that had earlier kept its distance approached. Up until this point, we hadn’t seen anyone else on the mountain, and still couldn’t see anyone below. I started wondering if they knew something about the weather that we didn’t. Then, a huge flash of lightening followed immediately by a loud rumble shook the entire mountain. I don’t know how far the bolt was from us, but it too close for comfort, and we motored to the nearest small tree cover. So much for “afternoon” thunderstorms. Todd headed down, and I ripped my skins off my split board and quickly put it together and rode down. We rode down to about 7500 feet and assessed the situation. 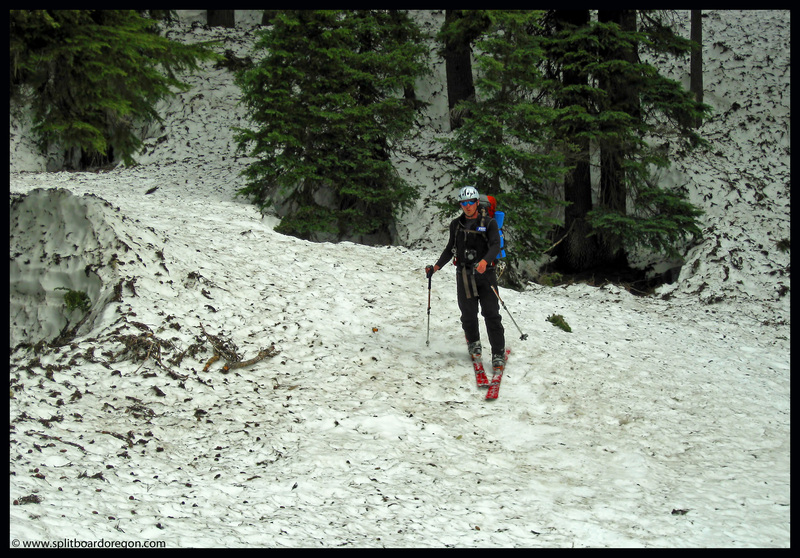 The weather continued to play games, so we decided to ski back to camp. The turns were nice and steep, but a bit slushy. On the way down, I broke one of my Leki poles in half trying to push on a traverse. 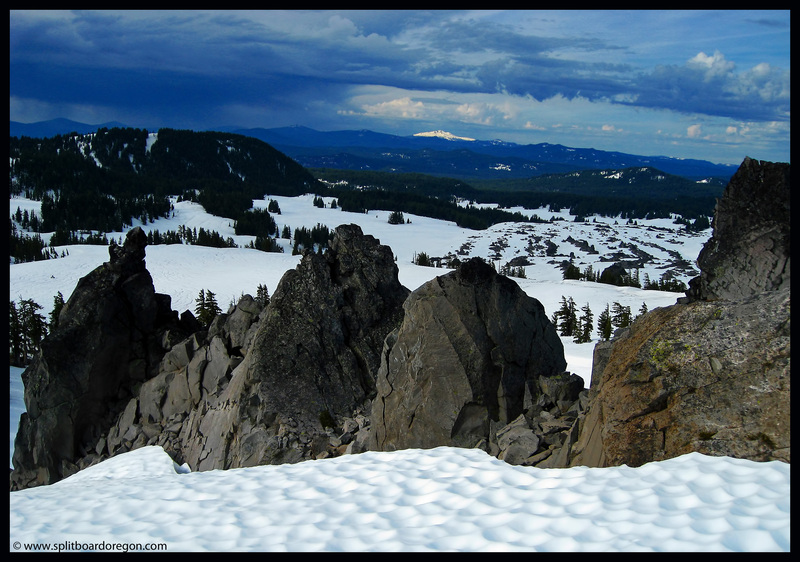 Back at camp, we toyed with the idea of going back up, but the snow was getting pretty sticky and the weather remained unstable. Damn – we would have been on the summit by 8:30am or sooner! Maybe we should have sumitted the night before and bivied in the summit crater? The weather stayed so-so, and with a broken pole, I didn’t know how easy it would be to skin all the way back up. We made some coffee at camp, and decided to run a few laps on Little Broken Top to the east. It was literally 5 minutes from our camp, and though short, provided nice playful turns and several laps. After lunch, we packed up camp and were able to link turns all the way back down to the car, 3000 vertical feet below. 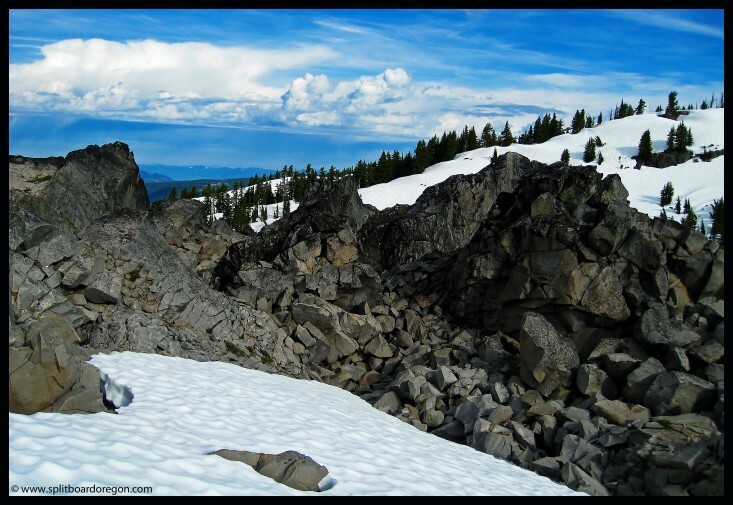 The snow in Hell Creek can be challenging at times, but always makes for an interesting ride…. The ski out to the road will probably be good for another week or so, but it’s going fast down low. The Deschutes Brewery beers were still nice and cold at the car when we returned.